A 30 wears post with this classic grey marle jersey maxi skirt is so overdue. It's been worn nearly 50 times (48 exactly!) since I bought it in my third trimester four years ago. The #30wears challenge is committing to wearing things you buy at least 30 times. As I take daily outfit photos, I have over 6 years of outfits to look back on and see all the different times I've worn things. Blog labels and searches in the archives come in helpful for pulling these posts together, and it's fun to see how many things I've hit 30 wears on. It's no secret that I love maxi skirts, and I've posted a few #30 wears posts featuring some of my maxi skirt collection (see them at the end of the post). Maxi skirts are for petites too! I got lucky with this Target one, the perfect petite friendly length with no hemming required. It was $25, so that's 52 cents a wear so far on it. It's got a lot of life left in it still, and it's not going anywhere from my wardrobe. Not bad for an impulsive pregnancy buy four years ago! A plain grey maxi skirt makes it easy to wear fun printed graphic tees, as it's a great neutral base. Even though one of these is a graphic tank instead of a tee, you can see it's still just as simple to wear. A nice easy outfit to pull together, the graphic top adds interest that the plain skirt lacks. 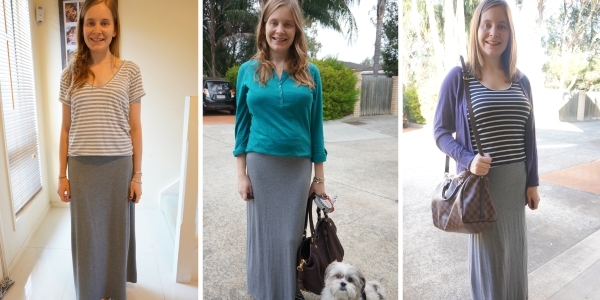 Maxi skirts work well in cooler weather with long sleeve tops. The long skirt protects your legs from the cold and keeps you cosy, and a longer sleeved top is an extra layer for a cooler day. If it's really cold, a scarf makes you even warmer. Again, you can see in these three outfits that the plain maxi skirt base means you can add fun printed scarves, bright colours, or even a top with embroidery detail, without your outfit feeling too overpowering. Sometimes you need a little more than a long sleeve top with a maxi skirt. 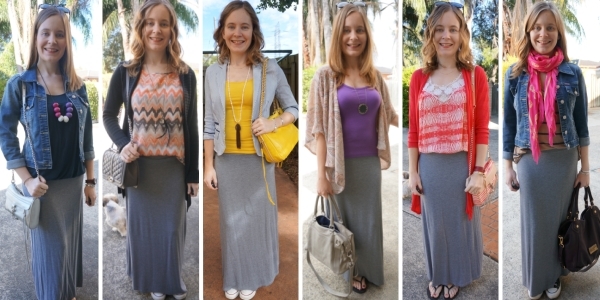 As I wear my maxi skirts year-round, I've worn them with all kinds of layers. You can see the variety in these outfits, with a denim jacket, cardigans, a blazer, and a kimono. I've also worn this skirt in the middle of winter with a leather jacket when it's been really cold. These layering options are great pieces to add in spring or autumn when it's too cool to wear a skirt and top on it's own. A maxi skirt is really made for summer though, it makes summer dressing easy. And if you have babies or toddlers, the long maxi length means you can run around with them and not worry about things being too short or showing more than you intended when you bend over to pickup the kids, or something they've dropped for the tenth time that day, ha! Lots of colourful outfits so far, but you can go completely neutral with a grey skirt and create a monochrome or monochromatic outfit. I like the two shades of grey together on the end there, but with the black v-neck tee is my favourite. I'm still sad that tee didn't survive through too many incorrect wash cycles on the washing machine and had to leave my wardrobe. Since I bought this maxi skirt while I was pregnant, it makes sense that the most frequent way to wear it has been with a baby bump. It's been so nice having this piece that I could wear through my third trimesters with both my boys - and still be wearing and loving it afterwards. I'm impressed the elastic has held up too, they were pretty big baby bumps near the end! Forgiving jersey material, a soft stretchy elastic waistband, all the things I loved about this skirt in pregnancy make it a great postpartum choice too. Much nicer pulling this on in the newborn days than attempting to squeeze into something with buttons, a zipper, or zero stretch! Having something you know will still fit and make you feel great makes getting dressed easy after being up all night with a newborn, and anything to make parenting easier is a winner! I've gone on about how great this jersey maxi skirt is to wear, but the material is perfect to travel with too! It's comfortable for a long day of sightseeing, it can be crumpled up in a carry on bag and doesn't need ironing at your destination. 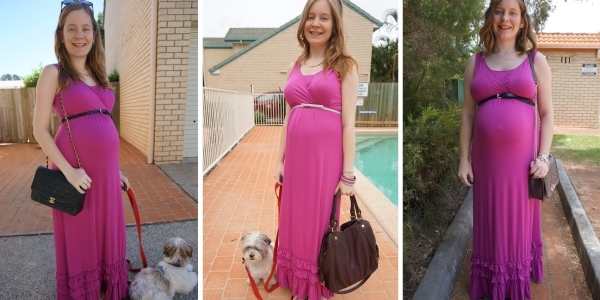 For pregnancy travel (the middle pic) it was wonderful, and for running around Sydney with two toddlers (the left and right photos) it works just as well. It makes me happy to have a piece in my wardrobe that's wrapped around my baby bump for both boys that's still going strong. It's nice to put together a post like this and see the bumps at different stages. So many fun memories attached to the times I've worn this skirt. I'm enjoying continuing the 30 wears challenge this year as it's great putting these posts together. This Target skirt is no longer available, but above are some great alternatives, all under $50! 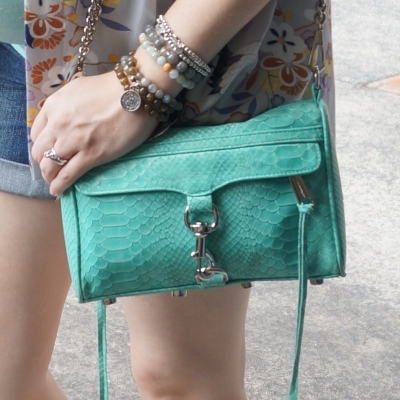 Perfect if you're looking for more ways to wear outfit inspiration! Alternative, see all the 48+ ways I've worn this skirt in my blog archives. 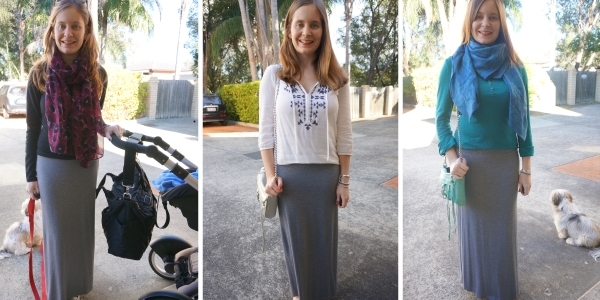 Linking up with Passion for Fashion, Lizzie In Lace, Shoe & Tell, Mix It Monday, Hello Monday, On Monday We Link Up, Modest Monday, Wardrobe Wednesday. The 30 wears series will continue in 2018, as I had so much fun doing it last year. Each month I'll show you 30 ways I've worn one of the pieces from my wardrobe in an effort to wear more of what I already own, and enjoy what I have instead of constantly buying more. 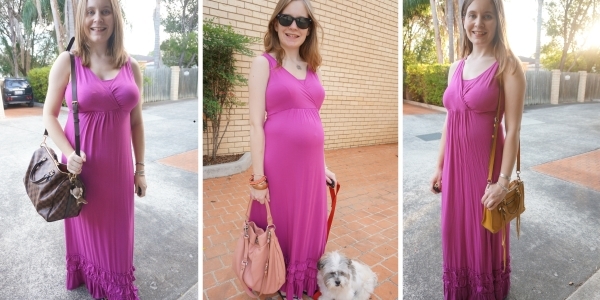 Kicking off this year's posts with a favourite, my 'Havana' pink maternity/nursing maxi dress from Mothers en Vogue. I'm surprised it's taken me so long to hit 30 wears with this piece, if you've been a regular reader you'll know I wear it often. Through 2 pregnancies and afterwards it always makes me feel great. 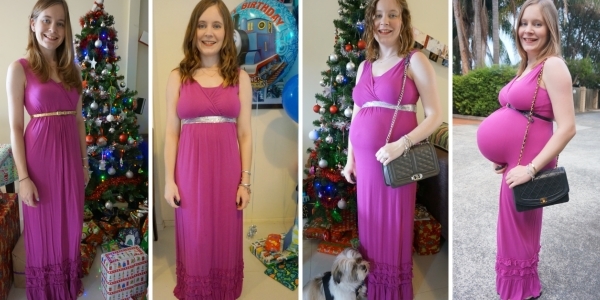 It's one of the pieces heavily featured in my pregnancy style book too! One of those maternity pieces I'm keeping in my wardrobe, even though my pregnancy days are behind me. It's tricky to calculate cost per wear on this dress as I received it courtesy of Zibibo back in February 2014. It's nearly 3 years old. 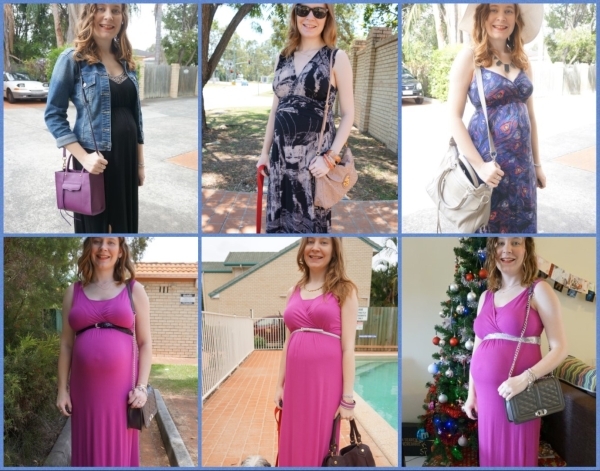 'Courtesy of 'means I didn't have to pay anything for it, although as I said when I got it, it made me rethink my normal budget for a maternity piece as it was certainly worth the $129.90 retail price. 30 wears in almost 3 years means wearing it about once a month on average, which is impressive for such a statement piece and given how many dresses I have already. All dresses that come into my wardrobe are judged against this dress. If they don't make me feel as good as this dress does, they don't stay! To have a piece that works for pregnancy and breastfeeding, for casual through to more formal events, is such a lifesaver when you're having the 'don't know what to wear' panic before an event. This gold belt is a very common accessory! The gold glitter belt works perfectly with the bright pink of my maxi dress, and you'll see it pop up many times in the photos below. Belted over a baby belly, or even just belted over my left over mum-tum, a belt is a frequent go-to with this dress. The best thing about a maxi dress is that it's an instant outfit. While I do like belting this maxi dress, sometimes you just want the simplicity of a maxi dress and not worrying about accessorising or belting it. As the empire waist on this maxi dress is elasticated, the belt is more for show than function anyway. When I do want to belt this pink maxi dress but I want something other than the go-to gold belt option above, I try to mix things up a little with this Louis Vuitton bandeau scarf worn as a belt. I love how the colours in the scarf compliment the pink dress, it's got pinks and purples and orange in the print. A bright pink maxi dress sounds pretty in your face, and when I ordered this I considered the grey one instead as I wasn't sure I could pull off so much pink. Every time I wear it though I'm so grateful I went with the colourful option. It's just so cheerful with all that colour. You don't need to stick with neutral accessories when wearing a bright dress. 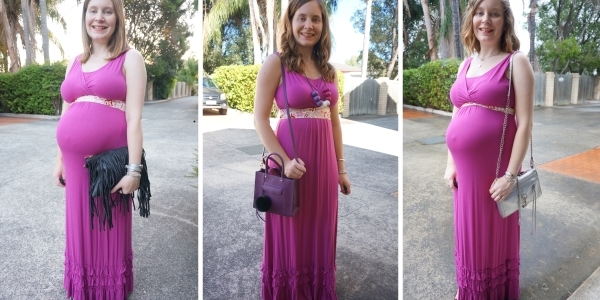 I like pairing the bright pink dress with colourful bags! Blue, purple or yellow, a colourful bag works nicely. As you can see I particularly love the pink and purple colour combination. I like this combo a lot, as you can see by my wearing it 4 times! The outfit with the printed snood is easily my favourite of all of these ones though. It was the first time I wore this dress without a baby bump, and I found it perfect for those early postpartum days. In spring or autumn a denim jacket is a great layer with a maxi dress, and you can add a printed scarf to keep you cosy if it's really cold. 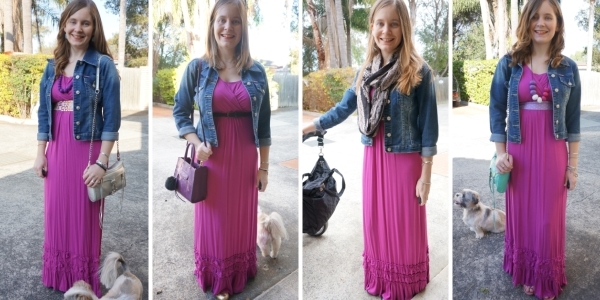 It's not just denim jackets that make good layers with maxi dresses! I like to wear cardigans with my maxi dresses, and for something different, a kimono. You can even try belting the layer over the top of the dress too, as I've done in two of the photos above. This Mothers En Vogue dress is a combo breastfeeding and pregnancy one, and it does both those things so well. With a nice bit of stretch, it easily covered a growing baby bump, even right through to the final days of pregnancy. It was nice to have something pretty I could pull on and feel good about in, no matter the size of the growing belly! Pregnant or not, this beautiful dress has become my default for special events. Christmas day, birthday parties, date nights. I think everyone needs that one staple piece in their wardrobe they can pull on for an event that makes them feel special. For me, this pink dress is it. I love how it turned out to be the last thing I photographed for the blog before giving birth to baby boy, it's such a cherished piece and that makes it even more so. Some of these are nursing ones too! Hope you enjoyed this trip down memory lane and the chance to see the baby bumps across two pregnancies. This dress really has been worn to so many things, and accommodated all of the pregnancy and breastfeeding related body changes so well 😂 Want more outfit inspiration? 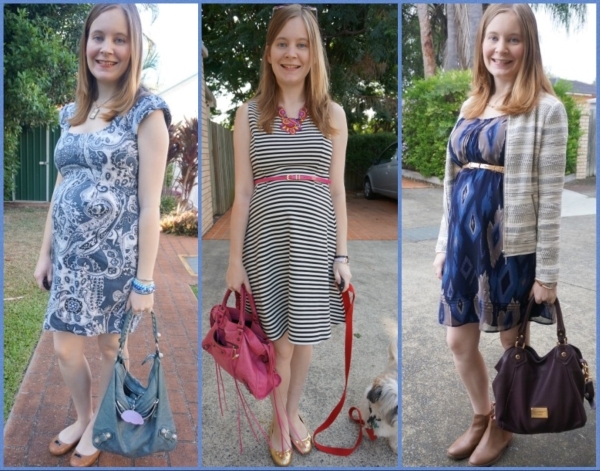 Browse through all the times I've worn this MEV dress on the blog. Linking up with On Mondays We Link Up, Turning Heads, Trend Spin, The Style File, Style Sessions, Confident Twosday, Fashion Frenzy, Oh Hey Girl, Style on the Daily, Fashion Frenzy, Fun Fashion, Flashback Fashion, Weekend Wear, Passion for Fashion, Modest Monday. Another month, another #30wears achieved for a piece from my wardrobe. This time it's another maxi skirt. It's interesting that there are only a few jeans that I've hit 30 wears on but I've easily hit that on so many of my maxi skirts. I've always thought I was more of a jeans than skirt person, my style has definitely evolved over the years. 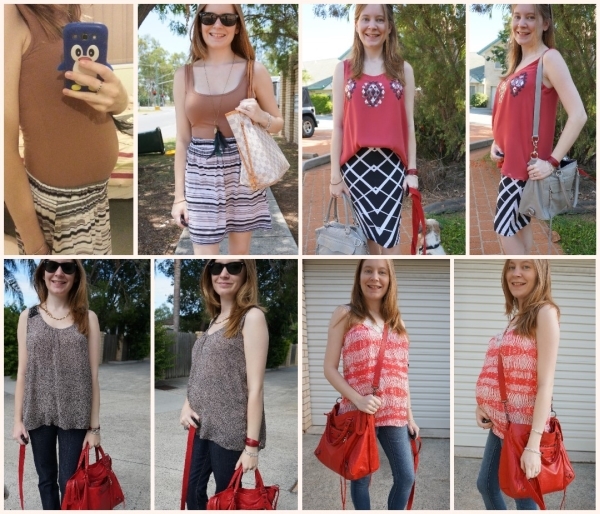 It's useful having the blog to look back on and see what I've worn over the years, and it's great that I can compile my outfit pics together into posts like this. I have started to look up pieces I'm close to 30 wears on and wearing them a little more regularly, as you've probably seen on Instagram. I do want to wear more of my wardrobe, but I'm also enjoying the challenge of thinking up more ways to wear things to hit 30 wears. While I don't wear a lot of white, I find this maxi skirt so easy to wear. Being machine washable helps! The stretchy elastic waistband has stretched through to the third trimester of two pregnancies and still fits perfectly post-baby. 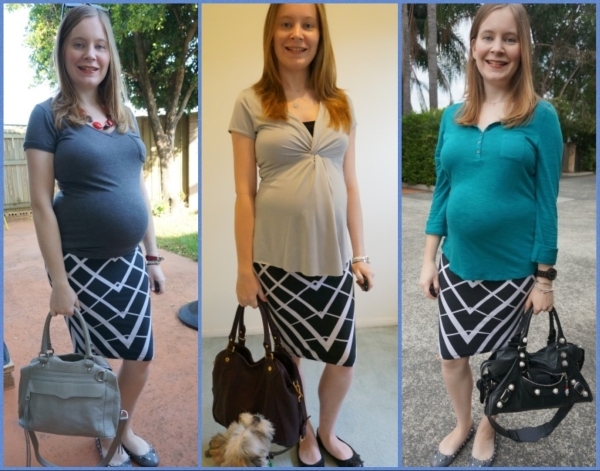 Non-maternity clothes with elastic waists are wonderful in pregnancy. 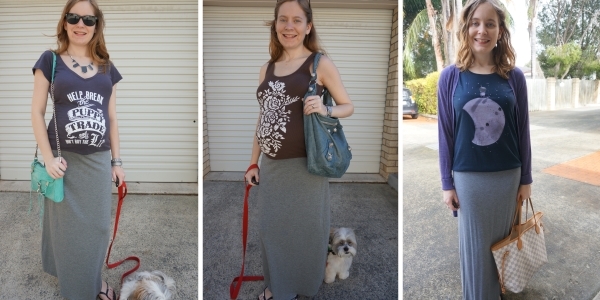 In fact the very first time I wore this skirt I was pregnant, it's a great pregnancy piece. It's not just pregnancy this works well for though! 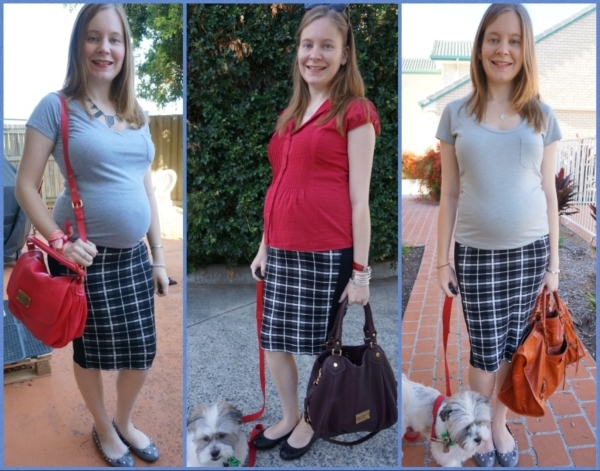 Stretchy skirts are great postpartum and incredibly comfortable post-baby. It's easy to see why I've hit 30 wears on this. In fact, half of them were during pregnancy and the other 15 were when I wasn't pregnant. Really funny to see the perfect split when I counted up the 30 wears. A printed skirt doesn't mean you have to wear it with plain pieces! 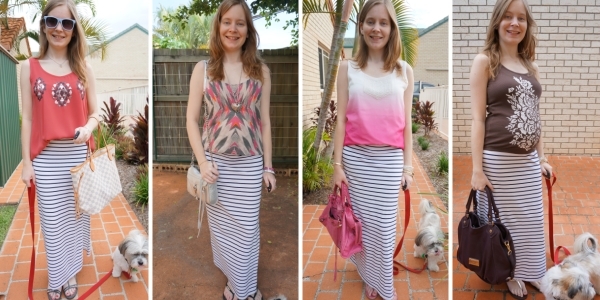 I've enjoyed doing a little print mixing by pairing the striped skirt with printed tanks. If you're looking for something slightly different you can add something extra to the stripes with embellished tanks with beading or sequins. The benefit of the beaded and sequin embellished tanks were that they draw the eye up and away from what was an early second trimester baby bump. Of course as you can see with the brown floral tank, you can only disguise a baby bump for so long! Get more ways to hide a baby bump here. 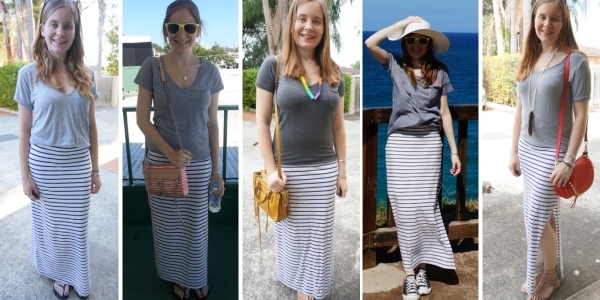 Since the white maxi skirt has a navy stripe, it's good to be matchy-matchy and wear a navy tee with it. 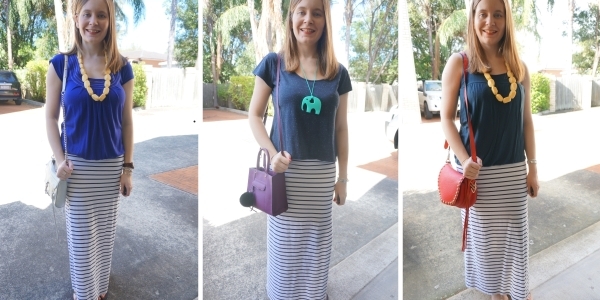 It's a quick fool-proof outfit technique you can use for any printed piece. Grab a plain piece in a similar colour to one that's in the print to wear with it for an easy outfit that is perfectly co-ordinated. 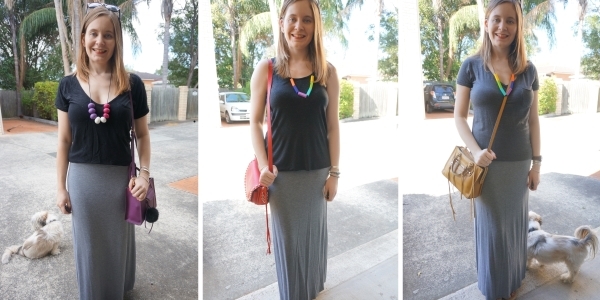 A grey tee is another one of those fail-safe outfit options with a printed maxi skirt. I have quite a few grey tees in my wardrobe, as you can see above as each time I've worn this skirt it's been with a different grey tee! I like them when I need a neutral piece to wear with a print. 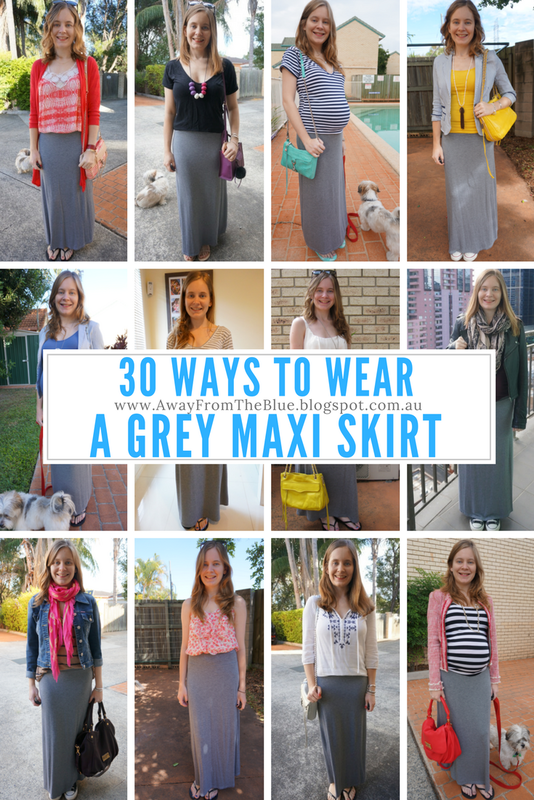 A grey tee and a maxi skirt is a favourite frequently worn combination of mine. A grey tee will always be a classic to me. A nice neutral grey tee lets you be a little more bold and adventurous with your accessory choices and I like to wear a bright handbag often with grey tees as the colour really pops. 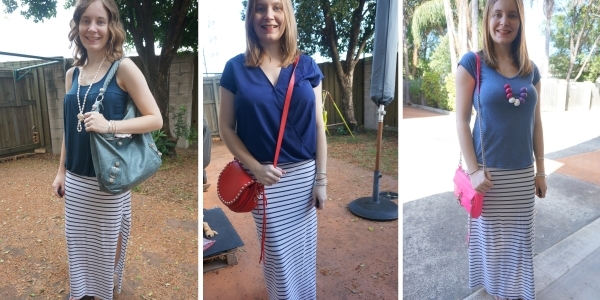 While grey tees are a great neutral with prints, and you can easily pick a navy top for an easy coordinating outfit, I like wearing bright and colourful tanks with this stripe maxi skirt too. 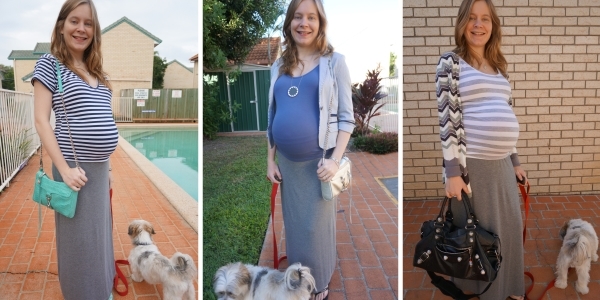 I love this in pregnancy, as my colourful fitted tanks really work nicely to show off a baby bump. Because this skirt is a non-maternity piece, there is a limit to how far the elastic will stretch around a growing baby belly. When it hits its limit, a maternity tank comes in helpful as the longer bump-covering length lets you wear the skirt lower with the waist band under the baby bump like in the last photo. I try to wear most of my wardrobe year-round, but with the slit up the side it gets a little too cold to wear this maxi skirt over winter. I make it work outside of summer by adding a light layer, something as simple as a scarf or denim jacket, or a little more colourful with a printed kimono or colourful knit. Just that extra layer can make it easier to wear this skirt for spring or autumn. 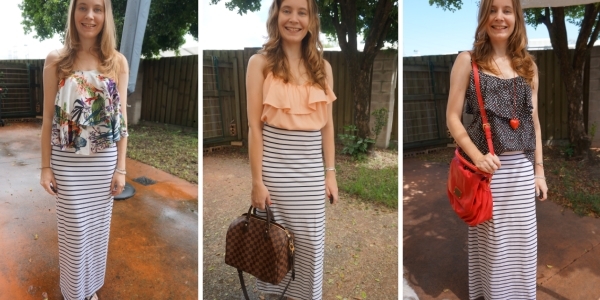 You don't have to keep maxi skirts just for summer! Sometimes i's nice to add some extra texture to your outfit. The close fit of this jersey maxi skirt means voluminous tops are a good pairing with it, and my ruffle camis are such fun pieces to wear. You can even add in some print mixing like I've done in two of those three outfits above. Stripes really do go with so much, and a strappy cami is a wonderful piece to wear in the summer heat. 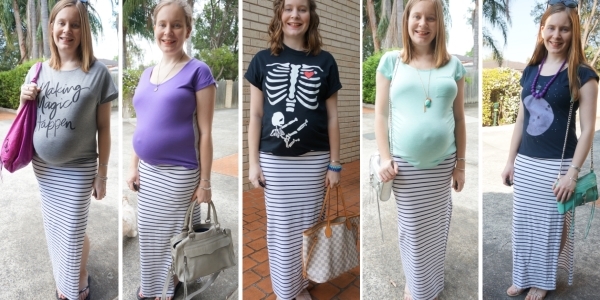 As you can see above, I love my grey tees and my navy tees with this striped maxi skirt. Any kind of tee pairs beautifully with a maxi skirt though, and as well as some brightly coloured ones it's been fun wearing graphic tees with this striped skirt. 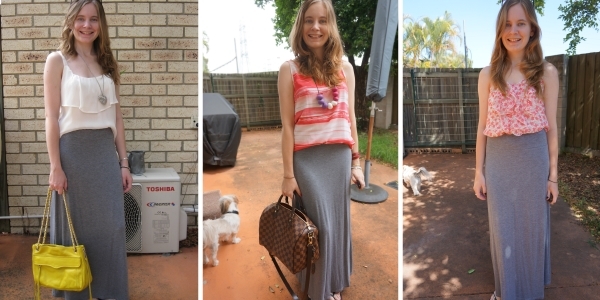 It makes a great casual outfit for places like playgroup if you're wanting to dress a maxi skirt down a little. 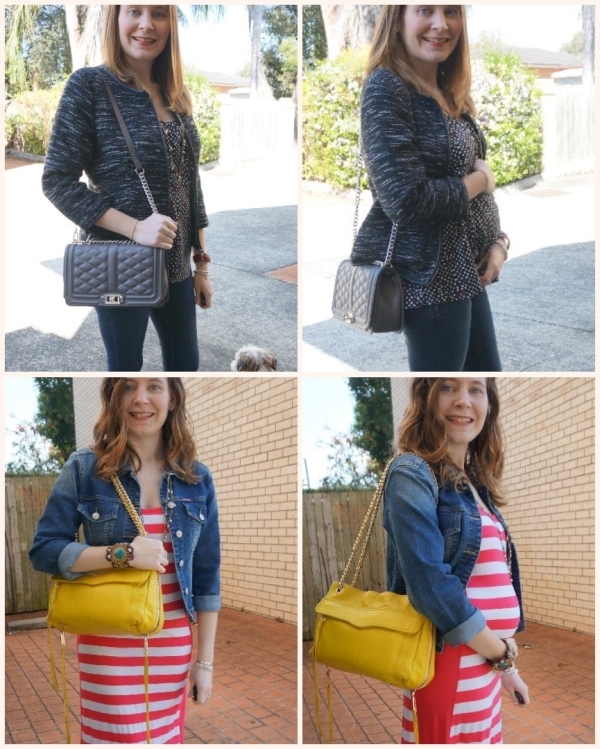 A simple outfit formula like this can continue on in pregnancy as well! 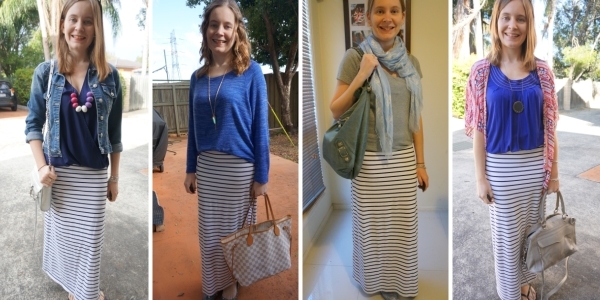 A striped skirt can be surprisingly versatile, and this was definitely good value for money! I bought this Atmos & Here maxi skirt back in 2013 for $17.45, so it's now down to 58 cents per wear and still going strong 4 years later. Want more outfit inspiration? 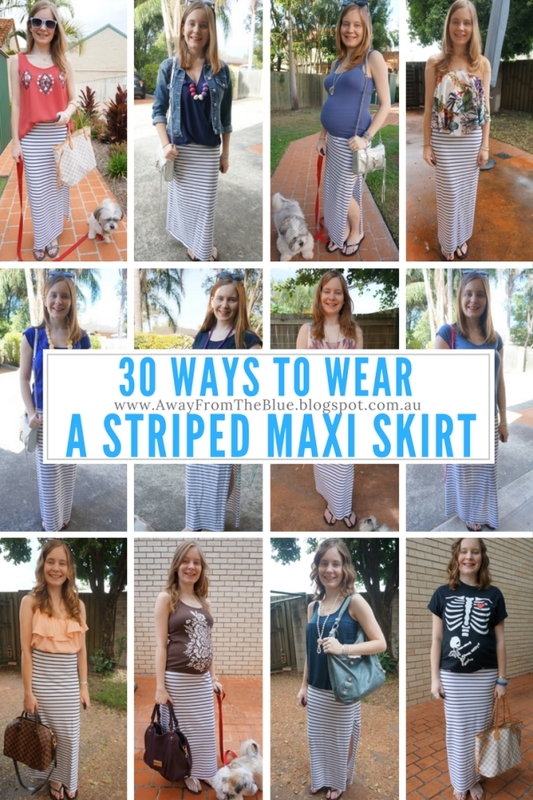 All the 30+ ways I've worn this striped maxi skirt. Linking up with Fashion Frenzy, Fashion Files Fun Fashion, Fabulous Friday, Friday Faves, Weekend Wear, Passion for Fashion, Flashback Fashion, Modest Monday. 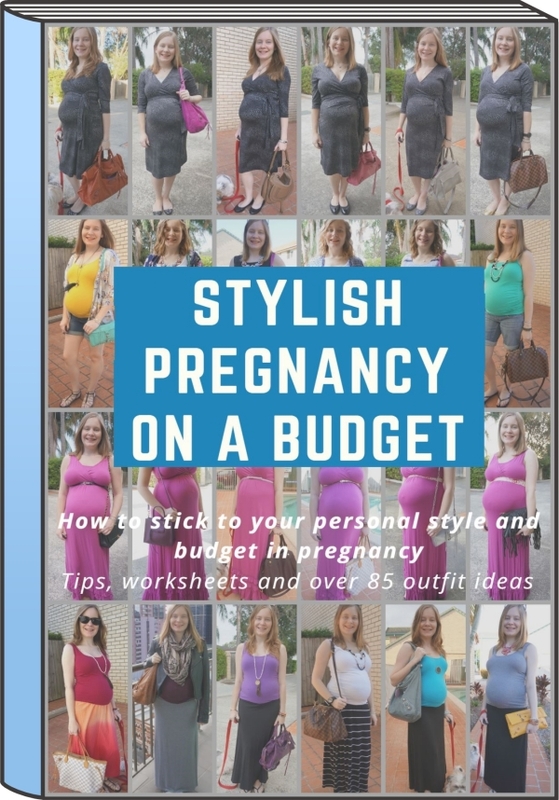 How to Have a Stylish Pregnancy On a Budget: eBook & Giveaway! This has to be the most nervous and excited I have ever been about posting. I'm sharing my first eBook! It's a guide for you to identify your own pregnancy style and wear what works for you and your growing bump. I've crammed it full of all of the best tips, tricks and exactly what you need to know to effortlessly dress your bump and feel comfortable and confident through your pregnancy. It explains how to navigate maternity clothing and only buy what you really need, identify what you already have that will work for you, and even how to create your own pregnancy capsule wardrobe. With more than 5 years of personal style blogging over two pregnancies, I have of course included a lot of outfit inspiration and ideas too. 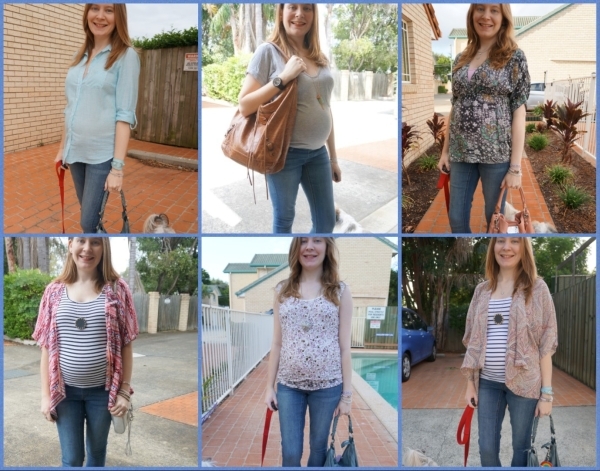 When you're pregnant your 'I have nothing to wear' days increase as your growing baby limits your wardrobe options. 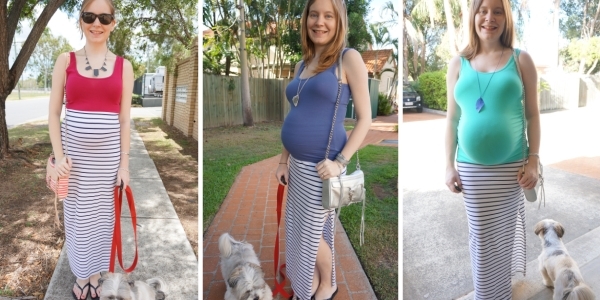 With this pregnancy style guide you'll be able to minimise those days! You'll know what outfits you have in your wardrobe that will work for you in each trimester and be able to stay true to your personal style through your pregnancy. It's got the knowledge I acquired through two pregnancies so you don't have to make the same expensive mistakes I did when buying maternity clothing. It's normally $2.95, but for everyone who enters the giveaway to win a copy I'm giving you a special discount code just for the book launch. The discount code will bring the price down to $1.50, even if you don't win the giveaway. The code is only valid for 48 hours so snap it up when you can! Just click here to buy it. Newer readers might wonder why I'm coming out with this book now, over a month after baby boy's first birthday. This has been a long time in the making. Spending time in July last year with a special friend gave me the confidence to give the book a try and I started writing it. With Baby Boy's health issues and hospital stay it just kept getting pushed back further and further. It's come together now with a lot of support and encouragement! A little later than I hoped, but I'm no less proud of managing to actually write an eBook. I even have an affiliate program, so if you like the book and want to be part of it send me a message. All of the early feedback has been so positive and I'm thrilled to be able to offer this pregnancy style resource to you! Enter the giveaway below to get your discount code and have the chance to win a copy. To enter, leave a blog post comment telling me who you'd want to win the eBook for. The answer that makes me smile the most will be the winner. Giveaway ends on Sunday 28th May. Winning is a game of skill, judge's decision is final. Excited about the ebook but don't need it in your life right now and can't think of anyone who does? That's okay, I've got an outfit to share too! This is what I wore for Baby Boy's first birthday party. 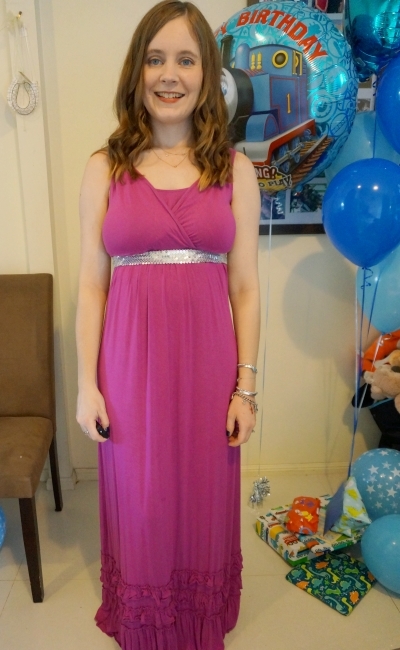 I wanted to wear this pretty dress again after it was the last blog photo I took while pregnant with him, seemed fitting to wear it for his party. The first birthday is always an emotional celebration, but even more so this time. Since Baby Boy's speedy arrival into the world things have been so different in so many ways, but through it all we have been blessed. Thank you to everyone who has supported us over his first year, from friends and family helping us to people online reaching out with advice, support and encouragement. Last worn: sequin scarf, Mothers En Vogue Maxi Dress. Other ways to wear: sequin scarf as a headband, pink maxi dress and denim jacket. 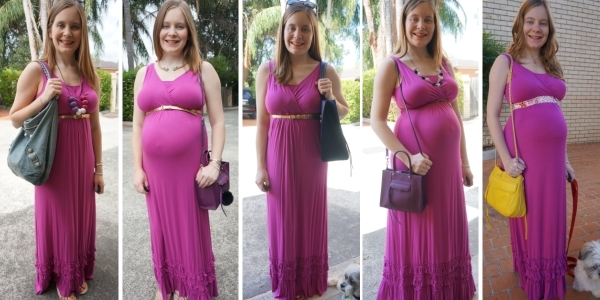 Perfect for pregnancy: Mothers En Vogue maxi dress at 39 weeks. Linking up with Style Nudge, Mix It Monday, Modest Monday, Hello Monday, How I Spring, On Monday We Link Up, Monday Mode, On Trend, Style Sessions, Confident Twosday, Turning Heads, The Style File, Spread The Kindness, Midweek Inspo, What I Wore, Oh Hey Girl, Wardrobe Wednesday, Thursday Moda, Fashion Files, WIWT, Spotlight Weekly, Fun Fashion, Fabulous Friday, Weekend Wear, Flashback Fashion, Passion for Fashion, Friday Faves, The Ultimate Rabbit Hole, Tip Tuesday. 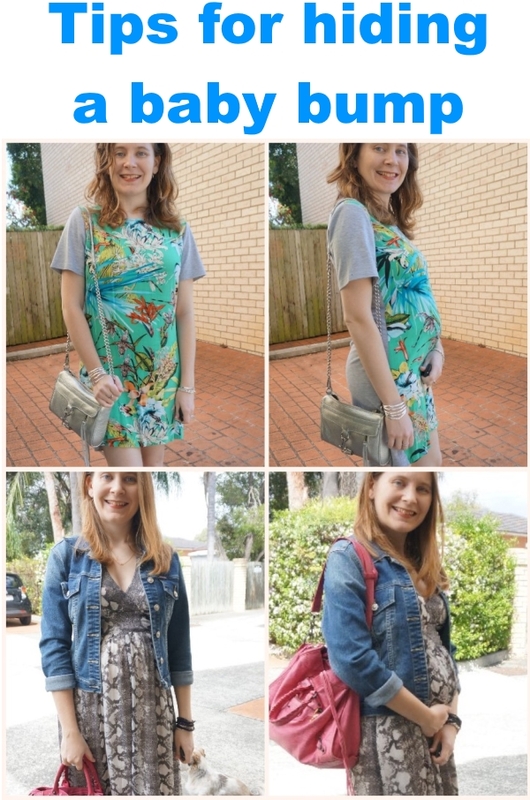 I've been blogging for over 4 years and through two pregnancies, so I thought a wrap up of my favourite maternity outfits would be a great resource for anyone looking for pregnancy outfit inspiration! 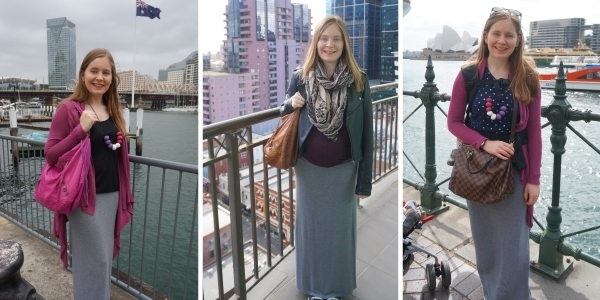 As well as sharing my second trimester travel essentials I previously did a series about my wardrobe changes in each trimester you might find helpful too. I spoke about what worked and what didn't in my second trimester. 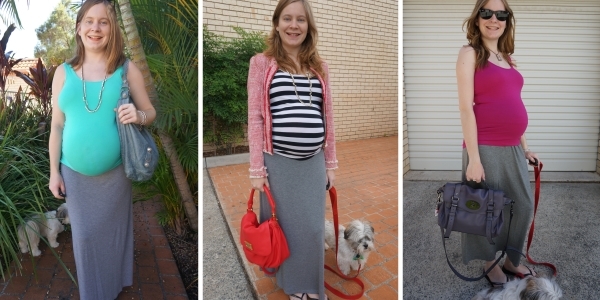 This will be a very photo-heavy post as I share a few of my favourite second trimester outfits. 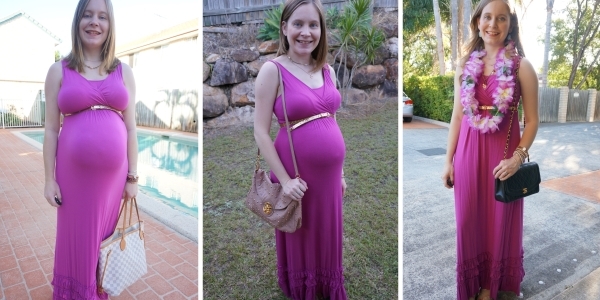 38 different pregnancy outfit ideas! There are links below all the photos if you want more details. I bought two ASOS maternity pencil skirts and they got a lot of wear in the office. 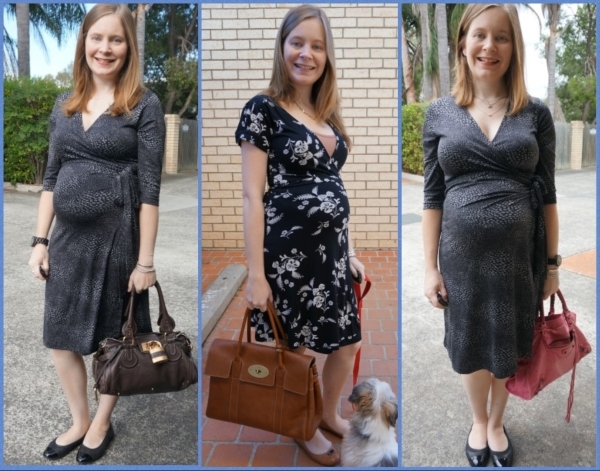 My single maternity wrap dress was a real wardrobe workhorse, being worn almost weekly, although I continued to wear my regular non-maternity dresses in the second trimester as well. Fit and flare or empire waist dresses were perfect for this. 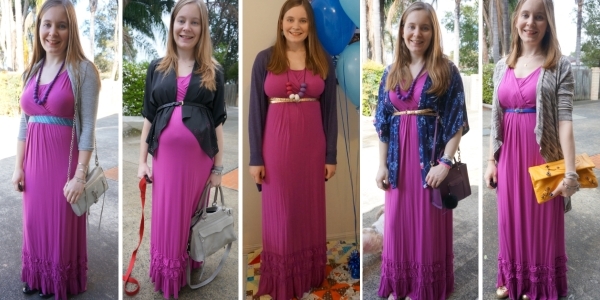 I only needed one maternity maxi dress for both pregnancies, the majority of my existing maxi dresses were stretchy enough to work through all three trimesters. There were a few I outgrew in the second trimester though. I added a second pair of maternity denim shorts to my wardrobe for my most recent pregnancy as I was heavily pregnant over summer and it was too hot for jeans. Previously I was doing a full work week and with the cooler temperatures and dressing for casual Friday, my maternity jeans were worn a lot more. First up, hope everyone has an awesome Australia day tomorrow! We had a BBQ over the weekend and it was wonderful catching up with everyone. If you're doing some shopping there are a lot of extra sales and discounts on for Australia day! I've wrapped up the best at the bottom of the post. Congrats to 'Wehaf' who won the sunglasses giveaway. I'll have another giveaway this week. Now, what I've been wearing. 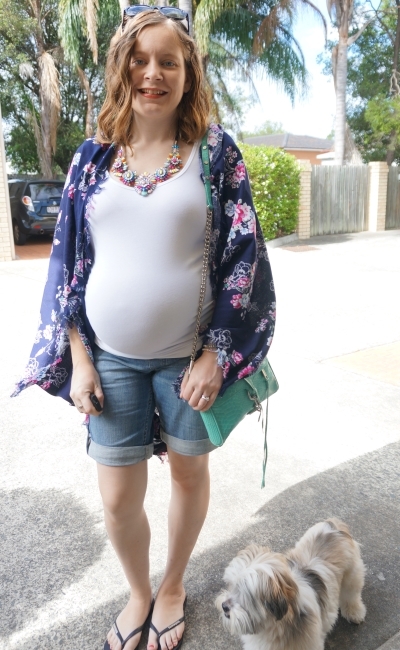 I have been loving kimonos and denim shorts this summer! I picked up yet another new kimono when we went boxing day sale shopping. Although I'm frowning a little in this picture (it was really bright!) I love this outfit. I'd happily wear it over and over again. The statement necklace was an awesome Christmas present from my bestie, and this kimono is the one I got in the sales. Reduced from $39.95 to $3, I couldn't say no! It's more of a cocoon style and feels just like being wrapped in a giant blanket. Although not too warm, it is still perfect for the summer heat and was great for a morning at the library singing and dancing with toddler T.
I really liked the colours in this outfit too. The style challenge for the day was 'animal instinct' but the animal print pieces I thought I could wear the bump had outgrown, so I had to have a subtle nod to the theme with the python embossed leather on my Rebecca Minkoff mini MAC. Last worn: Ray-Ban Wayfarers, white maternity tank, Jeanswest maternity denim, Havaianas, Rebecca Minkoff mini MAC. First time I've worn the kimono as it's a recent purchase. 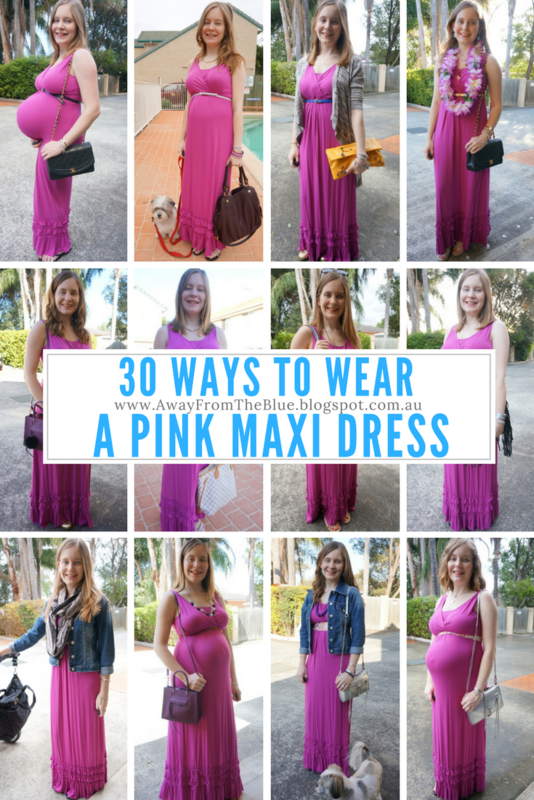 Other ways to wear: white maternity tank with blue and pink, Jeanswest maternity shorts and a maxi cardi, Rebecca Minkoff mini MAC and a maxi skirt. Another kimono! My favourite from my Asos sale order last year. They are having another sale at the moment, 15% off everything with code 'SWEETMATE' for Australia day! Wore this out shopping. We've been seriously de-cluttering over the Christmas break and while we donated a lot and discarded a lot more, realised we had a lot of things we wanted to keep (like toddler T's artwork!) but nowhere to put it. We went out to buy a few boxes and check out some more of the sales. I had a Jeanswest voucher I'd found when cleaning out that expired the next day so it was a good excuse to go shopping there too. The style challenge for the day was 'dramatic eyes' which I didn't even attempt - I know my limits with eye makeup! - so I just skipped it entirely, and wore something I'd been thinking of for a while. 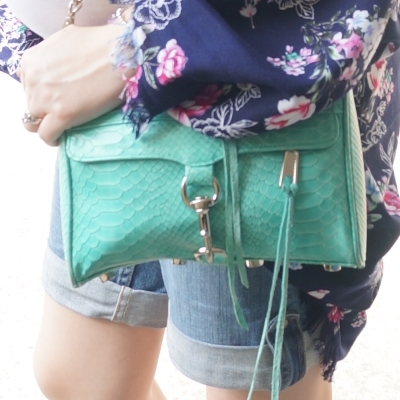 It thought the sea glass green colour of this maternity tee would look nice with the print on the kimono, and was pleased with how it turned out. Last worn: Ray-Ban Wayfarer (above), Somedays Lovin' kimono, maternity tee, Jeanswest maternity shorts, Havaianas, Rebecca Minkoff mini MAC (above). Other ways to wear: printed kimono and a maxi skirt, green tee and a white scarf, Jeanswest maternity shorts and a colourful summer outfit, Rebecca Minkoff mini MAC and flared jeans. Get 15% off everything at ASOS with code 'SWEETMATE'! Extra 20% off sale items at the Iconic with code 'EXTRA20'! Get an extra 20% off sale items at Sass & Bide with code 'AUS20'! Don't delay, most end on Tuesday evening! Linking up with Style Nudge, Let It Shine, Hello Monday, Classy Monday, Mix It Monday, On Trend Tuesday, Style Sessions, Turning Heads, Confident Twosday, Wardrobe Wednesday, What I Wore, Fresh Fashion.